The above list contains only names that either refer to pumpkin in general, or to oilseed pumpkin in special. The numerous names for other cultivars used as vegetables (marrow, squash, pattison, zucchino, courgette and many more) have not been included. Seeds, dried and toasted, and the oil extracted therefrom. Toasted pumpkin seeds have an intense, spicy–nutty fragrance. The flavour of pumpkin seeds oil is so strong that people often have to grow accustomed to it. Pumpkin seeds contain sizable amounts of protein (35%) and approximately 50% fixed oil, whose fatty acid profile is dominated by unsaturated fatty acids, namely linoleic and oleic acid. There are many trace constituents like tocopherols (0.1%) and phytosterols (total 0.1 to 0.5%); of the latter group, many are specific for the family of even the species. The dark green colour of pumpkin seed oil is caused by carotenoids (15 ppm, mostly lutein) and even more by porphyrines (13 ppm, mostly chlorophyll b and pheophytin a). Pumpkin seed oil stains have terminated the career of many garments, particularly shirts and ties; the stains, however, pale quickly (though not always completely) in direct sunlight. See also annatto about vegetable colourings. The flavour of pumpkin seeds and pumpkin seed oil develops in a toasting procedure, which is applied to the seeds immediately before extracting the oil. In this process, a multitude of volatile, flavourful compounds forms via the Maillard reaction. There is little scientific research in that field, but it seems that the most important flavour contributions come from pyrazines, e. g., 2,6-dimethylpyrazine. 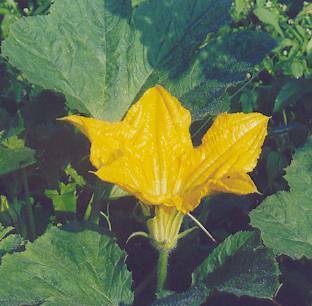 Pumpkin, Cucurbita pepo, is native to Central America, especially México, where it has been cultivated for millennia. 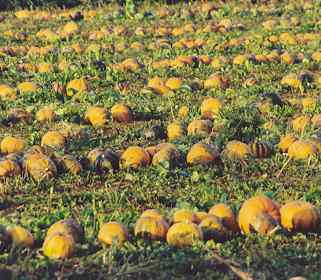 After the Spaniards had discovered America, pumpkin was imported into Europe and Asia, where it was welcomed as a cheap and nutritional vegetable. 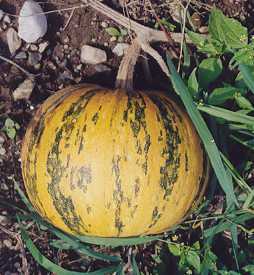 Pumpkin seed oil is won from a particular mutant (Styrian oilseed pumpkin, Cucurbita pepo var. styriaca) with tender, non-woody, seed hulls, which is cultivated only in South-Eastern Austria and the adjacent areas of the neighbouring countries. Pumpkin seed oil is produced in greater scale only since the begin of the 20.th century. Pumpkin seeds (pepitas) are a popular flavouring in Southern México; they both thicken the foods and lend a nutty flavour to them. 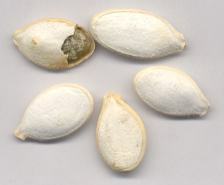 Pumpkin seeds appear in many recipes from that region, e. g., the sauces known as moles (see sesame in general and Mexican pepper-leaf for Green Mole, mole verde). Before usage, seeds are shortly toasted to develop their characteristic flavour in a dry pan or on the Mexican comal. 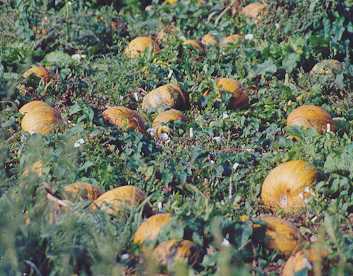 In most European (and other) countries, pumpkin is a popular vegetable, but it is grown as an oil plant only in a small region in Central Europe, at the junction of Austria, Slovenia and Hungary. Pumpkin seed oil has a low smoke point and an exceptionally strong flavour which is comparable only to Chinese dark sesame oil, and is therefore not commonly used as a cooking medium; instead, it is valued as a salad oil and is occasionally used to flavour other types of food. 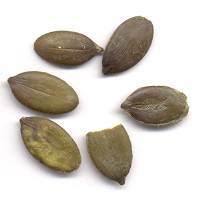 Pumpkin seed oil (German Kürbiskernöl) is extracted from pumpkin seeds that have been coarsely ground and toasted at temperatures of about 60 °C. Only by this procedure, its typical flavour is developed; pumpkin seed oils obtained by cold extraction are comparably tasteless. In the last years, production of pumpkin seed oil has much increased, since Austria’s EU membership has opened new markets; still, agriculture and production of the oil is mostly restricted to Styria (Steiermark), a federal state in South Eastern Austria (which actually happens to be the place where I have been born and raised). Styrian pumpkin seed oil is a dark greenish–black liquid, reddish on reflection and has an intense, nutty odour and flavour. It is often termed the Styrian Black Gold in reference to its dark colour similar to petroleum. In Styria, this oil is mostly used for salads, particularly lettuce: The lettuce leaves (almost dry if possible) are mixed with the oil such that a thin coating of oil is formed on the lettuce surface; then, the salad is finished by adding vinegar, salt and minced garlic, and occasionally herbs like chives or lovage. If done correctly, most of the oil attaches to the leaves, and there are only few oil drops swimming on the vinegar: Even here in Steiermark, pumpkin seed oil is expensive, a typical price being 15 € per liter. In Steiermark, pumpkin seed oil is also used to prepare salads from boiled beef, beans, potatoes and tomatoes, typically in conjunction with onion slices and garlic. Furthermore, it is used to flavour bread spreads based on cottage cheese. It is not used as a cooking medium, mainly because it does not tolerate heat very well and easily develops a burnt flavour; yet in the rural areas where it is produced, people sometimes prepare scrambled eggs with pumpkin seed oil as frying medium (Kernölschmölzi, almost untranslatable). Both because of the extremely intensive pumpkin seed flavour and the funny colour, this dish is reserved for true lovers of pumpkin seed oil only. … and then the seeds are separated mechanically. The pumpkin waste remains on the field. Outside of Styria, pumpkin seed oil is either traded as a mixture with up to 80% of bland vegetable oil (euphemistically termed salad oil , but junk oil would be fitter—well, I am a Styrian), or in pure form as an expensive delicacy. Despite the high price, it gains more friends year by year. It is a versatile flavouring, and the incomparable flavour invites daring cooks to try innumerous experiments: It can be used to lend a particular flavour to sauces (e. g., a most unusual mayonnaise, see tarragon about emulgated sauces), it is a good last-minute flavouring to be sprinkled over foods, and it is well-suited for flavourful vinaigrettes of various kinds. A rule of thumb says that all food that could be enriched with toasted pumpkin seeds will also profit from adding some pumpkin seed oil. In fact, I have even seen rye breads (see also blue fenugreek) that contained pumpkin seed oil. It has become common practice among restaurant chefs to add a few drops of pumpkin seed oil to pumpkin vegetable stews and pumpkin soups, to enforce a stronger pumpkin aroma. Thus, pumpkin seed oil shares the fate of other herbs and flavourings that have become popular, and even become hyped, in the last years, hopefully not to fall into oblivion in the years to come (other examples are rocket, coriander or basil). Personally, I often use it to improve the flavour of Mexican sauces and stews, even if some might frown on this habit. It is really good in chili con carne, especially when prepared with green chiles and tomatillos (tomates verdes) instead of tomatoes. Such a food would be called chili verde in the USA.